White is the new Port! White port has a nutty character, with lots of stone fruit flavour and is richer and fruitier than a Fino sherry or white vermouth. Aficionados dismiss white port as banal and Englishmen refuse to take it seriously. This should be the first big clue that it's worth trying and especially as a cocktail it's refreshingly first class. 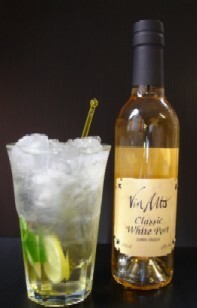 Here is a perfect way to try our White Port, with the most fashionable drink in Europe this summer. Only half as potent as a Gin & Tonic, you can drink this all night! Pour the white port in a long-drink glass. Gently crush the mint leaves between your hands and add to the glass. Add lots of ice, top up with Tonic water and garnish with lemon or lime. Stir and enjoy!